For the ultimate in portable video viewing, look no further than the Myvu Crystal. 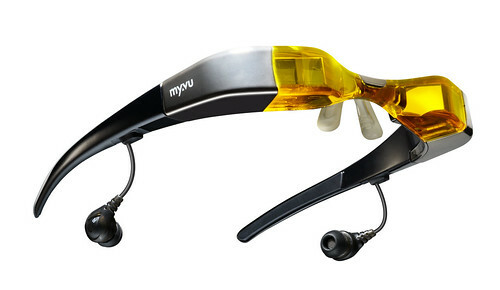 Like the shades that the guy from Star Trek wore, the Myvu Crystal allows you to enjoy your videos in the privacy of your own glasses. What Myvu have created is a technical marvel. Something that kids used to read about in science fiction magazines. 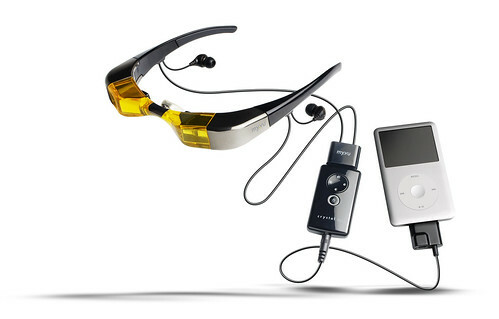 These geeky looking goggles feature displays in each eye-piece and attached headphones that allow you to view and listen to your videos on the go. The Myvu Crystal features technology taken from it’s parent company, experts in optical technology for medicine and military applications, to create a lightweight media player coming in at 82 grammes. The lenses don’t completely blank out the outside world, allowing you to remain aware of what’s going on around you. So the honest truth is that you’re not going to be wearing these walking around town, but for when you’re commuting on the train or on the plane then this is an ideal way to block out the world for a few moments peace. When you put on the Myvu Crystal, you get a 640 x 480 pixel VGA resolution display in a 4:3 aspect ratio. At first, it takes some adjusting to before your eyes get used to the picture but after that initial settling-in feel, it’s quite comfortable on the eyes to just sit back and watch the video. Because the unit only weighs 82 grammes, your head doesn’t feel like it’s got any more weight attached to it than you would wearing a normal set of specs or sunglasses. It was comfortable to wear for extended periods of time. Screen size equivalent isn’t anything huge, it felt like having a 20-inch 4:3 TV set in front of me, which compared to the size of the iPod screen is a definite bonus, but not exceptional by any means. My expectation before using, hearing or reading anything about the Myvu was a full picture. Power comes from an independent source to the iPod, with the included lithium-polymer battery that lasts up to four hours, good enough to squeeze in a couple of movies. The remote control gives control over the power, volume, contrast and brightness settings. The Crystal comes with the iPod dock-connector for plugging straight in to the 5G iPod or iPhone/Touch. It can also be used with other video sources using the composite video cable that’s included in the box. This allows you to use the Myvu Crystal with nearly any video source other than the iPod. For around £200, you can get a hold of the Myvu Crystal from the online Apple Store and specialist online retailers. Some will be turned off by the price straight away, after all your iPod probably doesn’t even cost that much. However, for others, in particular those who travel a lot, I can see that this might be an attractive option for viewing video comfortably and privately. I’m not quite sure these would work so well in the real world, but if none of that mattered, then this is actually quite a cool product. Would like to see for myself how ‘big’ the display looks though.